Denzel Valentine led his Sexton Big Reds to a 75-58 victory over Lansing Eastern last Friday, clinching the league title for Coach Carlton Valentine, and improving to 17-1 overall. Eastern was ranked #1 in Class A prior to the game. Sexton is currently ranked #1 in Class B.
Valentine scored 17 points, grabbed 8 rebounds, dished 4 assists, and made 4 steals. The game was close until half-time, as Sexton finished the second quarter with a 12-0 run. Michigan State won its fourth consecutive Basketball Conference Championship based on games played over the past weekend. The Men's Team has clinched the 2012 Title. The Men's Team also won the Big Ten Title in 2009 and 2010. Last year, the MSU Women's Team won the 2011 Big Ten regular season championship. Basketball teams from the University in Michigan did not win any such titles in those years, nor did they do so in the past 25 years. Or, in the case of the UM Women's Team, never. In related stories, some dogs bit some people today, the sun rose in the east and then set in the west, and taxes are due again soon. Continuing his methodical recruiting and player analysis, Dantonio continues to recruit for need, not just "best player available" and continues to stay ahead of recruiting services. These players have not yet been rated by major recruiting services. But it appears both will be rated highly when grading is complete. 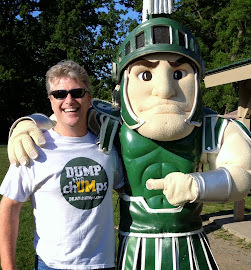 The Spartans now have four verbal "commitments" for the 2013 class. They still have to play their senior year in high school, but Dantonio has earned the trust is his evaluation processes. I'll take his judgement over recruiting services or the "offer every highly rated player method employed in chUMpsville". 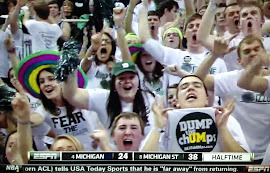 For the record, of chUMps 2013 verbals, MSU has lost a few head-to-head to them, but Dantonio had not offered the vast majority of them. 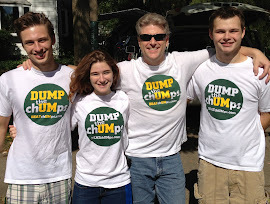 I believe that chUMps offered at least two of the four MSU's verbal commits. Click here for M-Live Story. Reader Comment from that post: Per the OSU rivals page, they have Powell ranked above two players who already earned 4 stars. Powell is still waiting on being graded and ranked. Shelton is sorta the Ringer to Holmes being the Caulcrick. Thunder and lightening coming back to MSU to take over after Bell and Thompson move on to NFL. 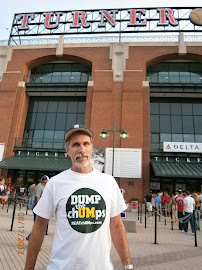 Click here for Detroit Free Press Story. Click here for more in depth on RB - Shelton with video. He has the 4.4 speed to play WR as well. Click here for more in depth on Safety - Powell with video. Remember that, by visiting the site directly, there are real time links to dozens of Spartan Sports stories for local and national sources. 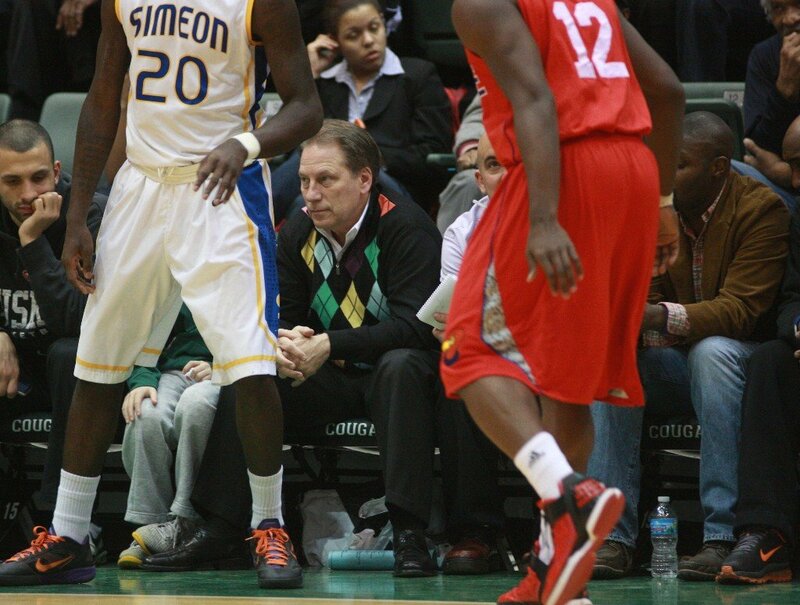 View full sizeCourtesy PhotoMichigan State coach Tom Izzo watches last week's Chicago Public League championship between Simeon and Curie. Simeon features Jabari Parker, the nation's No. 1-ranked junior. But Izzo's primary target appears to be Curie sophomore Cliff Alexander, who some in the Chicago basketball circles believe Izzo is chasing with a fervor not seen from Izzo in Chicago since he recruited and landed Proviso East's Shannon Brown in 2003. Tom Izzo's vigorous recruitment of Proviso East High School's Shannon Brown is still remembered in Chicago's basketball community. Michigan State's coach went as far as Texas to watch the 2003 Illinois Mr. Basketball — to see him play in a pickup game, no less. Mostly, though, Izzo was noticeably visible around Brown in Chicago. Folks who coach and cover hoops in the talent-rich Windy City say Izzo hasn't been back with such persistence until now. His target: Curie High School sophomore Cliff Alexander, an offensively raw but gifted 6-foot-9, 240-pound five-star prospect, rated No. 9 by Rivals.com in the class of 2014. Alexander definitely notices. For a while, his Twitter avatar was a picture of him and Izzo together. Izzo can't speak publicly about Alexander (or any unsigned prospect, for that matter) until he signs a letter of intent, no earlier than November of 2013. But Alexander learned how Izzo felt about him during their first phone conversation. "When he told me he loves me," Alexander said. Izzo's interest in Chicago's basketball talent these days also includes the nation's No. 2-rated junior, according to Rivals.com, Simeon High School wing Jabari Parker. Michigan State's coach watched courtside a week ago as Parker's Simeon squad beat Alexander and Curie for the Public League title. But Izzo's recruitment of Parker isn't what's being noticed in Chicagoland — it's how present he and his staff are in Alexander's world. "They've been visible," said Larry Butler, the longtime coach of the Illinois Warriors, Brown's old AAU program. More so than with anyone since Brown? "From what I've seen thus far," said Butler, who runs Illinois Spot-Lite scouting service. "They haven't targeted too many guys in our state like that. "And that's a good target to be on, because I think eventually he will be the No. 1 player in our state in his class. ... His upside his enormous." Michigan State’s legendary Jud Heathcote, who led the Spartans to 339 wins in 19 seasons as the head men’s basketball coach, is profiled Saturday in a new episode of Big Ten Icons, presented by Discover. Hosted by Hall of Fame broadcaster Keith Jackson, the show airs at approximately 10:30 p.m. ET, following the Michigan State-Nebraska men’s basketball game [Saturday]. The show includes new one-on-one interviews with Heathcote; Michigan State coach Tom Izzo; award-winning journalists Jack Ebling and Dan Wetzel; former MSU All-American Greg Kelser and others. The Lansing Sexton Big Reds scored a 25+ point victory over a non-contender last night, clinching a share of their league title. 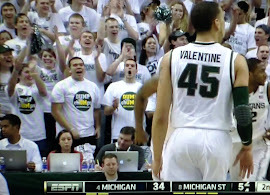 Spartan Recruit Denzel Valentine had 9 assists, 8 rebounds, and 11 points, as his team improved to 16-1 on the season. Lansing Sexton is ranked #1 by the Associated Press in Class B, while crosstown rival Lansing Eastern is ranked #1 in Class A. Those two teams will finish the regular season on Friday night, playing against each other before heading into the State Playoffs next week. Sexton won the previous meeting between the two teams. Carlton's younger son Denzel led his team to another win Friday night, 93-80 over East Lansing. Sexton is now 15-1. Valentine had 16 points, 7 assists, and 6 steals. It's time to jump back on the wagon and talk about basketball recruiting. I'm going to focus on checking in with Michigan State's future prospects but I'll start with a few notes about our currently committed 2012 players. It wasn't a big surprise but Gary Harris was named a McDonald's All-American this month. He gave MSU their third straight class with a player so honored (2010 - Keith Appling, 2011- Branden Dawson). Matt Costello did not receive a McD's spot but I'm confident that he'll surpass many of the players ranked ahead of him while at Michigan State. Outside of national acclaim, Matt has actively pursued the 2012 Mr. Basketball in Michigan and you can visit http://www.mattcostellomrbasketball2012.com to check him out. Costello is primarily competing against future teammate Denzel Valentine for the Mr. Basketball award. Arecent State news article on DV had some quality quotes focused on Denzel's desire to play with the ball in his hands. Valentine doesn’t mind what role he is given as long as he can be handling the ball and setting his teammates up to do well. "(I just want to be) out on the perimeter handling the ball," Valentine said. "Anytime in college, just giving me the ball and setting my teammates up (to do well) is fine with me." This is a reminder of the potential logjam next season at both the point position and on the wing. Many people have advocated for the idea that Valentine is a true point guard who belongs there to be effective, yet MSU returns Keith Appling and Travis Trice. You could move Appling or Valentine to the wing but the likely starters are Gary Harris and Branden Dawson. MSU also has the more effective than expected Brandan Kearney returning and what if Russell Byrd makes that famous freshman to sophomore leap? At the moment, this is an embarrassment of riches. Kenny Kaminski's recovery from a shoulder injury has been solidly on schedule and he made a cameo appearance in the Medina Bee's Senior Night game. Considering Kaminski is a big strong player, his shoulder problem should not be as problematic as it was for Adreian Payne entering his freshman year and Kenny should be ready for action this fall. MSU’s targets for 2013 appears to remain very selective. Despite all the names on the 2013 Hotlist, only Jabari Parker has an offer and the staff’s full attention. Others are either waiting for an offer or apparently not getting what you’d call the "full press." The word-of-mouth vibe has become that Jabari Parker’s recruitment might be shorter and more narrowed than originally suspected when the word was that he would take five fall officials accompanied by in-homes. First, Roy Schmidt of Illinois Prep Bulls-eye suggested that Parker might not use all five and could decide in October. More recently, Kyle Randle of Scout stated that Jabari might be ready to take his officials this spring. That would be a major surprise as most officials occur in the fall leading up to a decision. That was the story with big-time MSU recruits like Adreian Payne, Gary Harris, and many others. It’s hard to say what these pieces of information might mean but I still feel great about MSU’s chances with this rare basketball talent. We might know sooner than expected. Rumors flew that MSU was backing way off of James Young after his disastrous Christmas performance in front of Coach Izzo. That appears to have been premature. MSU coaches are still visiting and watching Young. As I noted a few weeks ago, Young played a monster game against a talented Clarkston team with Dane Fife there.Young’s offers are limited which suggests the MSU is far from the only team who wishes to see more of him before extending a scholarship. Trust in Izzo on this one. Jackson is a bit of the forgotten man in the 2013 class. After saying he’d commit to someone over the holidays then a sudden reversal, it’s possible that things aren’t exactly as they seem with his recruitment. He’s still very close to the coaches and program at Notre Dame and that appears his mostly likely destination. Still, you can’t dismiss MSU’s interest. Coach Izzo showed up in person to watch Jackson at the end of last month. MSU is closely pursuing more high school sophomores than juniors right now. MSU has a core group of SF/PF Jabari Parker, PF Cliff Alexander, C Jahlil Okafor, PG Tyus Jones, PG/SG Jaquan Lyle, and SG Drake Harris as their primary targets for what will probably be a two to four player class. Dave Telep over at ESPN broke the news that Duke has offered Tyus Jones. You might have a similar reaction as I did and say, "he didn’t have one already?" I don’t think this changes much. Jones is a major Duke target and this was to be expected. For MSU, pursuing Tyus Jones could be the first recruitment where Izzo’s expanded resources make a big difference. Despite being 700 miles away, Izzo has been to watch Tyus numerous times this season, even bringing his family along for the trip to Apple Valley, MN. It’s too early to handicap but Izzo has earned my benefit of the doubt when he’s all-in for a recruit as he is with Jones. Jones is widely considered the top point guard in his class. As reported by SpartanTailgate ($), Abu received an offer from MSU through his AAU coach. He plays for Kimball Union Academy in New Hampshire and is described either as a combo forward or undersized four man.Originally from Massachusetts, he reclassified from 2013 to 2014. This offer doesn’t sound like MSU’s typical MO and with players like Parker, Young, and Drake Harris still available, I don’t expect Abu to become a Spartan soon. Right now, this is in the "one to watch" category. Coach Izzo made it out of state this week to watch Jabari Parker and 2014 post player Cliff Alexander play in the state tournament. Alexander is one of MSU’s primary recruiting targets and the interest is mutual as MSU is Alexander’s publicly stated leader. Of all the players we’re talking about, he might be the most likely to choose MSU. Alexander is still considered a defensive player first but has been an important scorer in Currie’s run through the playoffs. They have an epic match-up tonight when they face off against Parker’s Simeon team to avenge their only loss of the year. I wouldn’t be shocked to see MSU representatives back to take in the game. When you’re a 6-10 freshman, people start noticing early. Though I don’t typically get either analytically or ethically excited about discussing freshman prospects, it’s worth noting this little nugget in a recent article about Towns, Jr.
"Know when I realized my son was good?" Karl Sr. said. "When colleges started visiting him (this year). 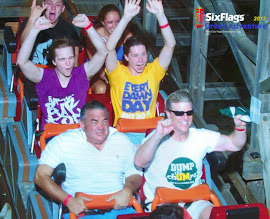 When Tom Izzo came in. When Cincinnati flew in. When Kentucky showed interest. When Syracuse came in and visited. Villanova was in the house. When I saw all them cats in the gym, Jay Wright and everybody asking about him, I said these coaches are coming out to recruit a freshman. It’s always nice to hear our coach as the first person someone mentions. Though this is outside the Midwest, it wasn’t long ago that MSU was in the thick of recruiting Dexter Strickland out of New Jersey. Way early, but we know that Coach Izzo has already been in to express interest in Towns, Jr. This whole article is good and worth a read as an introduction to this young man. 1. How quickly can MSU finalize the deal and wrap up a commitment from Cliff Alexander? 2. What will we continue to learn about Jabari Parker's process and timetable? 3. What is standing between James Young and a Michigan State offer? 4. Not much "news" on him but another good question is whether Drake Harris is a football player or basketball player first or a true two-sport college athlete? How will prioritizing these two influence his options of Michigan and Michigan State? Here's to a big commitment this weekend that makes much of this obsolete! Jonny Reschke announced his commitment to Michigan State via Twitter this afternoon. "Just joined the Spartan family. COMMITTED TO MICHIGAN STATE!!!!". Reschke is ranked a four-star recruit by Rivals, Scoutand 247 Sports. Reschke reports offers from Michigan State and Toledo and will play Middle Linebacker for the Spartans. His commitment wasn't expected today but MSU did not take a Middle Linebacker prospect last year and the rumor was MSU was leaving this spot specifically for Reschke to become Bullough's replacement. Some idiot blogger guest writing for the Only Colors even went so far to project him as our 2015 Mike. Obviously this early in the recruiting cycle there's no reason to get too worked up about a lack of offers. If this were August and he were rolling two offers deep I'd be a bit more concerned. What's to love about this kid? He sheds his blocks really well. There are several times in the two minutes of the video where a dude runs up to him and Reschke slides the kid out of his way. He seems to run to the sidelines really well and attacks through the offensive line quite nicely. Swagger, he has it. I think there is no more important place in a sport for swagger than playing defense in American football. Areas for improvement? He tackles high and doesn't always take the best angle but that's a little nitpicky. The things that matter, size, speed and swagger are all there. Jonny Reschke was the Mike of the future probably as far back as a year ago. We've been keeping this spot warm for him and today he's taken it. He'll be a great addition to the MSU defense and I'm excited about this commitment. Of all the talented skill players Michigan State signed Feb. 1, quite possibly the team's best addition doesn't come from the high school ranks. Michigan State picked up a transfer prize in wide receiver DeAnthony Arnett, who joined the Spartans after a year at Tennessee. Arnett, a Saginaw, Mich., native, made the move in January to be closer to his ailing father. An ESPNU 150 prospect in 2011, Arnett passed up the chance to stay home and went to Knoxville, where he caught 24 passes for 242 yards and two touchdowns as a true freshman last season. He'll continue his career in East Lansing, where the Spartans could use him right away after losing their top three receivers (B.J. Cunningham, Keshawn Martin and Keith Nichol) from 2011. The 6-foot, 170-pound Arnett is applying for an NCAA waiver that would make him eligible to play immediately rather than sitting out a year. What has it been like so far being at Michigan State? DeAnthony Arnett: It's just been exciting. I'm just happy to be here, happy to be close to home and able to see my family on the weekends. That was the big reason why you came back. What has that been like, being a lot closer? Cal Sport Media via AP Images DeAnthony Arnett transferred to Michigan State in January so that he could be closer to his ill father. DA: Of course it's more responsibility being back at home. I'm just trying to take care of business and hope that everything works itself out. I'm calling a lot to check and see if anything is wrong. And I go home on weekends whenever I need to. Being an hour away is really different than being nine hours away. How have your new teammates received you at Michigan State? DA: Just like I'm their brother, like I had came in with the class last year. They definitely accepted me like I was already here. It wasn't one of those, 'Oh, you should have came here the first time.' They all respected my decision when I went to Tennessee, but they've accepted me pretty well. How many of the guys did you know from before, whether it was playing against them or in the recruiting process? DA: So many. There's too many to name. It's definitely a lot. Why did you pick Michigan State? DA: It's closest to home, to start. And being able to get a chance to study them and watch them, Kirk [Cousins] developed a great relationship with the three wide receivers. They're gone now, and us receivers who are here now, we have a chance to bond and build our own reputation. How do you see yourself fitting into the offense at Michigan State? DA: It's pro-style, and I can pretty much fit in anywhere. I'm just anxious to play. I definitely saw myself fitting in, being here, knowing that they throw the ball a lot and get the ball to their playmakers and let them do their thing in space. How much did you consider transferring to Michigan? DA: With Michigan, I never got a chance to talk to them, but they got in touch with someone at my school or whatnot. But I knew where I wanted to go. It wasn't a big decision [between Michigan and Michigan State]. I wasn't choosing between those two in the end. When you went through recruiting the first time, how much did you consider Michigan State and Michigan? DA: I considered both of them. At that time, it was neck-and-neck with those two, Tennessee, USC and some others. In the end, I chose Tennessee. Do you know where things stand with the NCAA waiver? DA: Right now, the university is handling that. I really don't know where it's at. I don't know when it's going to be sent in. We're just handling it, making sure everything is accurate and it's all ready when we send it off. I'm really anxious. I think about it all day, every day, whether I'm going to play or not. If it happens, it happens, and if not, I'll be ready to go next year . I miss those big moments, especially with Boise State coming in [for the season opener Aug. 31]. I definitely want to be in that game. You mentioned the three receivers Michigan State loses. How much can you help this team right away if you're allowed to? DA: I feel like I can come in and fill that void that those three left, stepping up and being a playmaker. It's something I've always done, stepped up to the challenge and have success. Like when Justin Hunter went down during the season at Tennessee, I stepped right in at Florida and did well. I've been reading some of your tweets. Are you getting some negative responses from fans since you made your decision? DA: Oh, yeah, you hear it all the time. After this decision, when I chose to go to Michigan State, a lot of Michigan fans would go, 'Oh, they really weren't recruiting him.' It's all fun and games. I'm focused on what I'm focused on and what I'm getting myself mentally prepared for. I'm ready to take on the challenge. Have you talked with [quarterback] Andrew Maxwell much? Have you worked out with him? DA: Yeah, definitely. He's helping me with the playbook. I've just been diving in and just getting ready. We're all anxious to see what's going to happen. I know I'm really, really anxious, and I know he's really, really anxious, too, so see what's going to go on with the [NCAA] decision. He's been helping me a lot. For people who haven't seen you, what type of player is Michigan State getting? DA: They're getting someone who's a hard worker, dedicated, a team player, has leadership. You're getting pretty much everything, I think. Are there certain parts of your game that stand out? DA: Just my quickness, getting open, me being a deep threat, me getting out in space and obviously getting those tough yards on third down. Michigan State's getting that type of player.